Rediff.com » Movies » Taylor Swift, Jake Gyllenhaal back together? Taylor Swift, Jake Gyllenhaal back together? It looks like Jake Gyllenhaal and Taylor Swift are giving their alleged relationship a second chance. Just weeks after breaking up, the two were spotted having dinner together in Swift's adopted hometown of Nashville. Gyllenhaal and Swift were seen eating at Bound'ry, a restaurant near the actress Nashville apartment. The two, who split at the end of December, sat by the fireplace and chatted as they ate their dinner. 'They did eat,' the Daily Mail quoted a fellow diner as telling People magazine. 'They were cordial to one another, but not affectionate,' the diner added. Sandra Bullock's ex Jesse James has got engaged to new girlfriend Kat Von D.
The motorcycle bad boy has popped the question to the tattoo artist after less than a year of dating. 'I have never met anyone so kind and loving and committed to making the world a better place every day,' the New York Daily News quoted James as telling People magazine. 'My love for her is beyond description. So honored that she said ''yes.'' Growing old with her is going to be a blast!" he said. Though 28-year-old Von D has known James since she was 22, the pair didn't connect until they were both single last year. Despite James' personal life being splashed across dozens of tabloid covers following news of his extra marital affair, he says he always saw the glass half full. 'You know, sometimes the public and press gets it wrong. This is one of those times; 2010 was actually the best year of my life because I fell in love with my best friend. An amazing woman who stood behind me when the world turned their backs,' James said. 'There is no one else for me. He's the one,' Von D added. It seems Meryl Streep can go to any extent to portray a role with perfection. The legendary actress recently caused a stir at the Houses of Parliament, after she turned up to watch the weekly Prime Minister's questions session as part of her research for the upcoming Margaret Thatcher biopic, reports the Daily Star. The star is taking on the role of the first female prime minister in The Iron Lady, and she attended the weekly debate at London's House of Commons between the country's leader and his opposition to get a taste of British politics. Streep sat in the public gallery to see Prime Minister David Cameron argue with his left-wing counterpart Ed Miliband, and the actress caused a buzz as politicians began to realise she was watching. According to reports, her visit was facilitated by the prime minister's office, although she left before having the chance to meet Cameron. Ready for this Saddam Hussein? Actor Sacha Baron Cohen is set to star in a comedy film The Dictator inspired by a book thought to have been written by ex Iraqi president Saddam Hussein. The movie is a loose adaptation of the novel Zabibah and the King, which was a best-seller in Iraq in 2000, reports the BBC. According to Paramount Pictures, the film would tell "the heroic story of a dictator who risked his life to ensure that democracy would never come to the country he so lovingly oppressed". Alec Berg, Jeff Schaffer and David Mandel -- writers on Seinfeld and Curb Your Enthusiasm -- have been recruited to pen the script. Larry Charles, who worked with the actor on both the Bruno and Borat comedies, will direct the film. Although Zabibah and the King was written under the pseudonym "The Author", it is believed it was written by ghost-writers carefully supervised by Hussein. The film will be released on 11 May 2012. 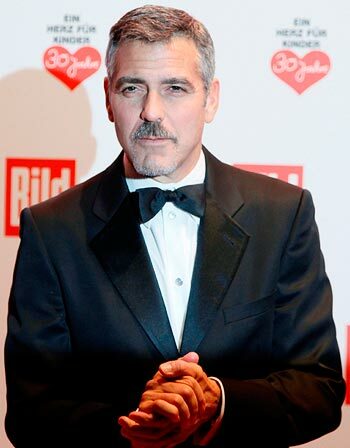 Hollywood hunk George Clooney has just recovered from malaria, which he contracted in Africa earlier this month. The news sparked minor panic among showbiz fans online after television host Piers Morgan revealed details about Clooney's health scare via Twitter. "BREAKING NEWS: George Clooney has contracted malaria following recent trip to Sudan," he wrote. However, Morgan, who replaced CNN's long-serving talkshow host Larry King this year, failed to mention the actor had since recovered. Clooney's representative quickly set the record straight, insisting the Oceans Eleven star was now in good health after receiving treatment for the condition. 'George is completely over the malaria he contracted while in the Sudan during the first week in January,' the Sydney Morning Herald quoted Clooney''s representative as telling Access Hollywood. The actor was in the Sudan as part of a humantarian trip with the United Nations and Google, called the Enough project. In a statement, Clooney said his recovery "illustrates how with proper medication, the most lethal condition in Africa, can be reduced to bad ten days instead of a death sentence."